Licence transferred 07.02.1922 to new house, adjoining the old house. Brewers Greene King obtained planning permission to build dwellings on the extensive car park by November 2016. 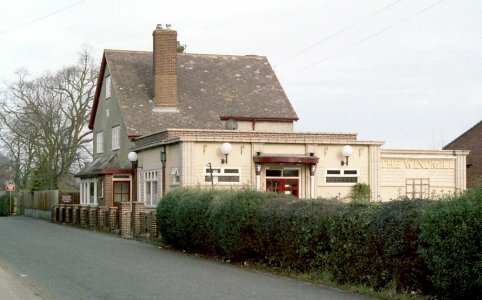 Public House offered for sale. Extension at east end is 1930's with some interesting features. Porch with decorative down-pipes with windmill design at top. Two rooms with central bar. Doors and woodwork in front bar original. Fanciful painting by G. Bates at back of bar shows Mousehold with windmill. Used to be a Victorian two-storey building- either replaced or completely adapted in 1921.